Our customer software proacda is a product of the eifas group. Proacda - our Software as a Service (SaaS) solution in the cloud - gives you access to your financial data and documents at all times. Trial balanca, accounting, employee data, payslips, travel expenses, expense reports and much more. Always up to date and available from anywhere. While adhering to the highest safety standards - i.a. ISO 27001, ISO 27017, the EU Data Protection Directive and the standards from the Federal IT-Grundschutz. Proacda centralizes your document management - just upload documents or connect your mailbox. Document categories are recognized and sorted. No more annoying search for paper documents. Manage your employees flexibly through proacda, including self-service onboarding, vacation management, travel expenses, and expense reporting. Our software is convenient and saves you time and money. Have full access to your data and create customized dashboards and metrics. Proacda is always up-to-date with your reportings - Trial balance, open items and receivables, totals and balances. Use the integrated service in our employee administration. 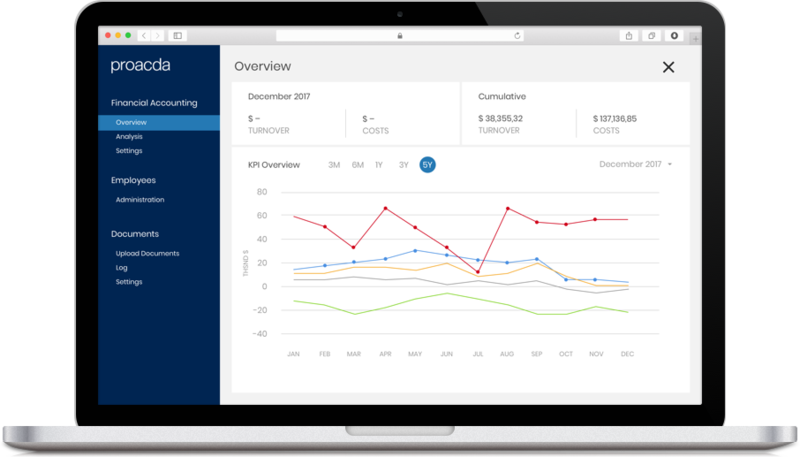 Easily create the monthly payroll statements of your employees. Our software takes you from work and gives you time to focus on your core business for total effiency and good workflow. Proacda is available in the cloud and from anywhere and works with all major operating systems - wether Microsoft, Windows or Apple MacOS. Of course, you can also access your data on the go - easy via tablet or smartphone devices. Proacda fulfills all important guidelines and certificates for data protection and data security - such as i.a. ISO 27001, ISO 27017 and the EU Data Protection Directives. Use proacda and our services to meet GoBD guidelines.